Nick Marinelli and I have wrapped up our first “debate” over at his blog, but I can’t help but add a few more comments here at my site on some of the topics we covered. One issue that came up was driver’s licenses for illegal aliens. Nick brought it up to demonstrate how far outside of the mainstream Hillary Clinton supposedly is because she, at least initially, supported the idea. But it really is a good idea, I countered, because it is not in our nation’s best interest to keep these people (13 million estimated illegal aliens) confined to the fringes of society. I can’t argue with that, except to point out that it is outside the realm of possibility. If you say that the best thing for society is X, that may be true. However, if X is unlikely to ever happen, then we must come up with some other answer as to what is best for society. Issuin them driver’s licenses is the next best thing, I would contend. First, there is the practical reason for issuing driver’s licenses to illegal aliens, and that is to ensure that drivers meet some standard to drive and to lower insurance premiums by decreasing the pool of unlicensed and uninsured drivers. It is to our advantage to be able to identify drivers and it keeps people from fleeing from minor traffic infractions for fear that they will be caught without a license. Fewere hit-n-run accidents, in other words. But if you do not find that argument persuasive enough, there is also an even more persuasive argument on the issue of national security. Here to back me up is a report entitled Not Issuing Driver’s Licenses to Illegal Aliens is Bad for National Security from the Center for Advanced Studies in Science and Technology Policy. Issuing driver’s licenses to this very large population (13 million-plus people) gives authorities the opportunty to screen and seperate otherwise law abiding illegal aliens from terrorists or criminals by confirming identity when licenses are issued. Contrary to the argument that denying illegal aliens licenses would prevent terrorists from 'melting' into society, it would instead guarantee a larger haystack in which terrorists can hide thus making it more difficult for law enforcement to identify them. Counter-terrorism strategy is based on reducing the suspect population so that security resources can be focused on more likely suspects. Denying identity legitimacy to 13 million illegal aliens -- the vast majority of whom are not terrorists or otherwise threats to national security -- just increases the size of the suspect pool for law enforcement to have to sort through. Since law enforcement resources are already unable to effectively cope with the large illegal alien population why further complicate their task? Also, by requiring proof of citizenship to obtain a driver’s license, it greatly increases their value on the black market and encourages illegals to obtain false ID’s with which to “prove” their citizenship. If 13 million people living within our borders can't drive, fly, travel on a train or bus, or otherwise participate in society without a driver's license and they cannot get a legitimate one, then the market will supply them an illegal fraudulent one. State DMV bureaucracies, no matter how well- intentioned, do not have the resources, training, or skill to prevent fraud driven by this additional demand and no federal mandate will be able to prevent organized criminal elements from responding. "On the other hand, if illegal aliens are allowed to get legitimate licenses upon thorough vetting of their identity, then the only ones who will be trying to get fraudulent documents will be terrorists or criminals -- who will face increased costs and more opportunities for mistakes if there is less overall demand - - and law enforcement resources can be focused on these activities. So there you have it. We are essentially shooting ourselves in the foot by not issuing drivers licenses to illegal aliens. It looks like I may have found a new local blogger willing to engage in polite discourse about election-year politics. What fun! Nick and I are currently butting heads over Bush’s tax cuts and immigration policy and so far we’ve managed to carry on a lively debate at his site without flinging poo at one another. There may be hope yet for a positive political dialectic in this country. I can't believe I've never devoted a post to The Kerrville Folk Festival. My friend Robert introduced me to Kerrville music many years ago and my wife and I attended our first festival in 1990 shortly after we were married. 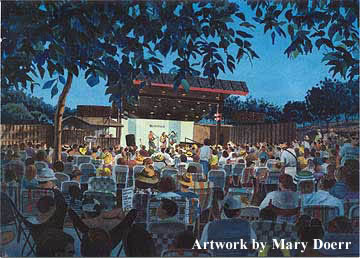 A few years later we ended up moving to Kerrville and I got to attend the Folk Festival pretty regularly for several years while working for the local daily newspaper. I haven't been back in a longtime, but hopefully we will got out there in the next year or two now that our kids are a bit older. I got a really nice hand-written letter from Congressman Charlie Gonzalez, D-San Antonio, the other day complimenting me for my recent Letter to the Editor that was published in the Express-News. I commend you for your great letter to the editor pointing out that often (almost always) there is no "middle ground" when dealing with George Bush. I appreciate your interest and insight. He also sent me a very nice 2008 pocket planner which I plan on using this year. Pretty neat!